Owners, leash your dog so no one gets hurt. Our precious dog, Tomlin, was attacked by a larger one on our last road trip. 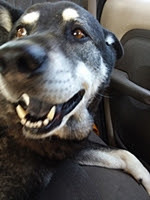 We stopped at a dam outside of Whitehorse, Yukon, Canada to give him a break from the car. Everything was peaceful until the dog with the stupid owner arrived. Our dog was properly harnessed, leashed and under our control. We had been walking around a few minutes before Stupid Dog Owner pulled in with his husky a way behind us and the two started walking. Hubby, Tomlin and I headed for the van when we saw the duo. The other dog reached us before we got there, sniffed Tomlin and dived in for his neck. In the minute it took us to get Tomlin inside, Stupid Dog Owner was loaded up and flying out of the parking lot - gravel flying.The entire incident would have been prevented if Stupid Dog Owner had used a leash. Leashes and harnesses aren't expensive. You can pick them up in a pet shop, Tractor Supply or even from Amazon. What's a few bucks compared with the life of an animal? Both dogs could have ended up seeing a vet (or worse) because one owner made a bad decision. Here's the thing. You can't blame a dog for being a dog. Our pets are animals. They will think and react as animals no matter how much we love them. Leashing dogs is a way of giving back some of the love that they give us. It protects both animals and humans. Failing to use a leash robbed him of the joy of pet ownership. Stupid Dog Owner and his beautiful dog lost a lot that day. 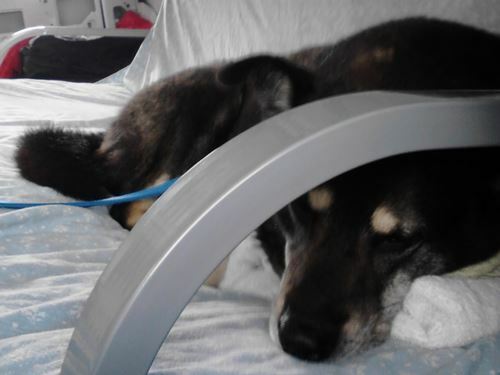 Failing to leash his animal cost him the enjoyment that comes from responsible pet ownership. Now, every time they go out Stupid Pet Owner will probably be looking over his shoulder. I pray that this owner has learned to do better. We tried getting the plate number as he roared off but only got a partial look. The RCMP officer in Whitehorse was sympathetic as he explained that little could be done without a full plate number. I knew that, but felt better for filing the report. Do yourself and your dog a favor. If you don't have a leash, get one soon. Poor Tomlin! I'm glad that he's okay. It could have been much worse. That other dog owner is very stupid. I also hope that it never happens again. I saw a dog off a leash kill a much smaller dog once. It was a terrible thing to see, and I'll never forget it.